This was a pretty good opener. It was fast and energetic, and the team of Konami and Yoneyama definitely helped the rookies look good. Good match. The pace was high the entire time and it was difficult to tell who was going to win. That kept things pretty exciting. There did seem to be a thing between Kyona and Savoy. Kyona was staring at Savoy before the match, and after the match she was very aggressive with Savoy. I liked that as buildup to their match later on. Despite taking quite a beating, this was a good match for Mimura. Natsu helped make Mimura look good, and Mimura got the last shots in after the match ended with Natsu attacking everyone with her whip. It wasn’t a great match, but I think this was more about Mimura’s struggle to overcome Natsu’s constant cheating and dirty tactics. Good match. The first part was mostly Kimura fighting Nakano and Kagetsu fighting Iwatani. After a while, Nakano was in the ring for a long time, and she ended up facing Kasgetsu. Nakano was definitely the focus of this match, and it makes sense given the story going into it. Nakano fought well, but she still has an uphill battle against her former friends in Oedo Tai. Very good match. This one built from a place of respect and competition to a fight to get in the last big move (or succession of big moves). There was a decently long feeling-out process followed by a gadual buildup of holds and submissions. The match was very grounded throughout, though there were some moments where they would stand and throw strikes. I liked this quite a lot. It’s a treat to watch Satomura, and Storm looked very good up against her. After the match, Meiko Satomura tells Toni Storm that this is the kind of match she wanted. Also, Satomura would like to do it one more time. With that, both women leave the ring. Mayu Iwatani heads to the ring and asks Toni Storm to come back. 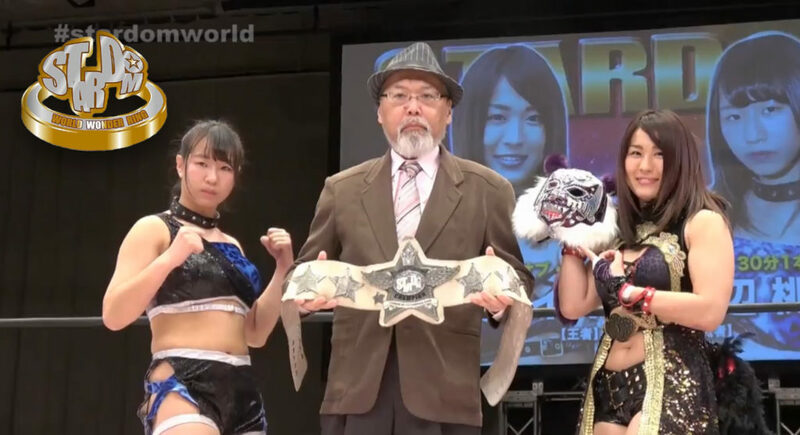 Iwatani says she couldn’t win the tag titles tonight, and now she wants the red belt back. 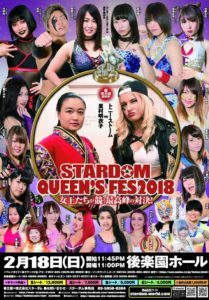 Iwatani challenges Toni Storm for the World of Stardom title on April first in Nagoya. Storm accepts. Very good match. Watanabe started quickly, and though Shirai was able to fend off Watanabe’s initial assault, Watanabe spiked Shirai with a tornado DDT early in the match that looked like it really hurt. Shirai didn’t move for a while, and when she did start moving it was mostly just to keep away from Watanabe. It was unclear how real the pain was since the referee kept going back to check on Shirai multiple times. The match continued though, and that DDT allowed Watanabe to dominate most of the match. This was a very strong showing for Watanbe, something think was needed if she really is being groomed to be one of the top wrestlers of the next generation. Later in the match, Shirai was in top form, but this match defnintely made a point that Watanabe is someone to watch. This was a good show. It had a little of everything, and the matches varied nicely in style (and quality). The final matches of the night were the best, and those were all very goof. I really enjoyed the Storm/Satomura match as well, but I think the title being on the line helped make the main event more tense and exciting. There also felt like some real drama in the title match.